One of the most exciting letters received in the twenty-nine history of the prayer seminar ministry is one dated July 31, 1989, from Panya Baba, president of the Evangelical Church of West Africa (ECWA), reporting on what had been happening there since our November 1988 prayer seminars. Let’s let him speak for himself. Greetings from Nigeria in the wonderful name of the Lord Jesus. Since you left, some good things have happened. There has been a great development and ECWA has begun to feel the experience of revival as a result of your prayer seminar ministry and the work of the Holy Spirit. The ECWA Plateau DCC Executives who attended the your seminar together with Rev. Onesimus Sule, the pastor of ECWA Seminary, Jos, arranged a Pastors’ Seminar for the DCC with prayer as the emphasis. Many pastors were blessed as the Holy Spirit touched their hearts. There were a lot of confessions about their shortcomings, wrong doings, ill feelings to each other, unfaithfulness, and the sin of prayerlessness with a lack of prayer for themselves and their ministries. All the pastors returned back to their local churches with a new zeal and vision. Some even apologized to the members of their churches their past unfaithfulness in the Lord’s work, especially lack of honest prayer. Nearly 1,900 registered for the August 24—September 9 prayer seminars in Peru. All two thousand Spanish prayer seminar workbooks were used. For the first week, the seminars were in northern Peru. Several seminars were in Piuri, the largest city in the area. From there we traveled to Talara, Rio Saco Prison, La Union, Sullana and Paite, Then, by bus, we began the trek southward along the Pacific Ocean with seminars in Trujillo (Santa Dominguto and Porvenir), Chimbote, Paramonga-Baccaro, and Chincha. We traveled 1,450 miles on the ground and 8,090 by air. SUMMARY: “Give account of your stewardship"
The coordination was excellent, thanks to Ted Cooper (South Carolina) and Pastor Vera (Piura). Travel was on time and the people were in place ready to begin at the scheduled hour. This was remarkable for so many seminars and made it possible to teach many pastors from a large number of churches. Once again, the value of the prayer seminar workbook was documented. Two years ago, the emphasis on Peruvian seminars was on pastors. From time to time, reports were received that pastors were teaching their people Christian life principles they had learned. During our time in Paramonga, one of the leading pastors from Lima attended and shared that he had periodically traveled into the mountains to teach folks in the churches there what they had learned. He was eager to have a supply of Spanish prayer seminar workbooks to continue his teaching ministry. Many pastors expressed an interest in having a supply of workbooks to teach in their churches and areas. The head of one of the denominations with which we worked plans to prepare a teaching edition and then bring pastors and teachers together to prepare them to teach. The Holy Spirit had His hand on each seminar bringing the Word of God alive via the voice of two interpreters who did a superb job—Israel in the Piura area and David for the rest of the country. There was group participation as everyone read together scriptures and other material from the workbook. There was individual involvement as folks stood to read. The teaching-learning techniques that have been so effective both in the United States and in other nations once again proved invaluable. The international prayer seminar ministry is a faith ministry totally. Our practice has been simple—“trust God and tell the people.” Over the years, I have discovered that when one hundred become prayer and financial partners with us, the needs are met. In this case, seventy-four contributors provided the funds needed to meet the budget providing workbooks, transportation, and food/lodging. 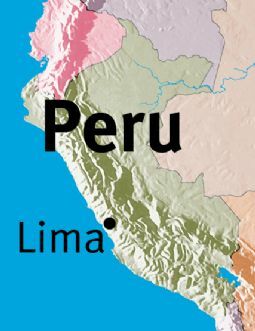 Peru is a land of contrasts—tropical Amazon jungles along the river, snow-covered Andean mountains, dry desert. The population is 29,180,899. The Peruvians are a beautiful people. About half is of Quechua Indian origin. This large indigenous group has preserved not only the Quechua and Aymara langagues, Pbut also a traditional Roman Catholic presence mingled with a strong animistic component. While 96% of the population is listed as Christian, only a small percentage are evangelicals. The result is a prevailing spiritual darkness for most people. At the same time, it is obvious that God is at work with many turning to the Lord Jesus Christ for salvation. The literacy rate is 94.5% for males and 82.1% for females. Life expectancy is 68.61 for males and 72.37 for females. There are many memorable expressions that I carry around in my mind from the prayer seminars around the world. One that came from the first seminars in Peru 2006 was one that I will never forget. Several pointed out that this was “the first venue in the country devoted exclusively to teaching the Word of God.” This was not the first time that I had heard a similar expression. Testimonies from participants have often said that in their Christian lives they had never had an opportunity to have in-depth guidance in the basic areas of the Christian life. This one fact accents the heavy responsibility that we have in teaching God’s precious children. For a number of years, I have had the desire to conduct prayer seminars in all fifty states in the United States. There are four elusive states where there have been no seminars: Montana, New Mexico, North Dakota, and Utah. There have been inquiries from folks living in these states, but so far no invitations. A prayer seminar requires six hours to cover the prayer seminar workbook (in English; add a little more time when we use an interpreter). Of course, we need a place to meet (a church, a hall, a home, or an outside area conductive to setting up chairs). We need someone to coordinate the event, which includes inviting others. 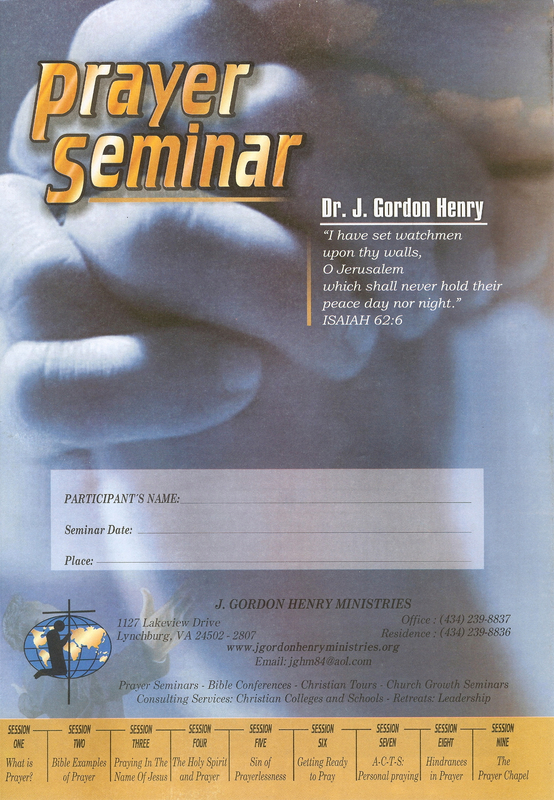 Since JGHM operates as a faith ministry, there is no charge or set fee for a seminar. We appreciate a love offering for the ministry, but if there is not one penny given we rejoice at the opportunity to share the word of God. Although we suggest a $5 contribution for the prayer seminar workbook, everyone is given the Prayer Seminar Workbook whether there is a gift or not. When possible, it is helpful to have assistance with travel and lodging (a home is fine!). For initial seminars in the four elusive states, our ministry will gladly pay the travel expense. So, what do you think? First, following Paul’s model, I solicit prayer support for open doors. Second, please let any of your friends/pastors in these states know about the AVAILABILIY of the prayer seminar ministry. God, in His providence, has kept His hand on the prayer seminar ministry. There is not been one seminar (currently there have been 1,375 seminars) where the Holy Spirit has not moved to bring the Word of God is alive. Paul said to the Romans: “I am ready” to share the Word of God. That is my spirit, also. After three intensive weeks on the road, I am glad to be home and settled back into the routines of daily ministry. There was abundant evidence of the Lord’s presence and provision each step of the way. From the time I left home in Lynchburg until I returned, I traveled 23,769 miles (1,220 ground). There were twelve prayer seminars and I preached in one Sunday morning service with 700 present from ten churches. That service began at 7:30 a.m. with a baptismal service for twenty-five new believers; it ended after 3 p.m., the longest service that I have ever attended. When I gave an invitation at the end of my message, several hundred “repented” and a large number trusted Christ as Savior. The presence of the Holy Spirit was vividly real as lives were drawn to higher ground. Hosea 10:11 - "And Ephraim is as an heifer that is taught, and loveth to tread out the corn; but I passed over upon her fair neck: I will make Ephraim to ride; Judah shall plow, and Jacob shall break his clods."